Boatersland Marine > Boats/Boat Motors > Fuel Tanks > Fuel Tank Accessories > Moeller 03576210 Reed Switch Electric Sending Unit - Length 10"
Moeller 03576210 Reed Switch Electric Sending Unit - Length 10"
Reed Switch Sending Units collect fuel level information more consistently then swingarm senders. They achieve this by taking the measurement from the float - which is still a moving part. However, the fluctuation is much less because the range of motion is much less. Durable 316 Type. Stainless Steel construction provides efficient performance. Length - 10". 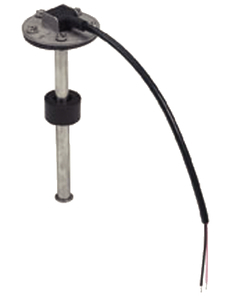 Tank Depth - 11"
Designed for use in gasoline applications.